BACKGROUND: von Willebrand disease (vWD) is the most common hereditary bleeding disorder, affecting up to 1% of the general population. OBJECTIVES: Estimating the prevalence of vWD among adolescents. DESIGN: This study was conducted between February 2014 and January 2016 on Saudi students in Riyadh. SETTINGS: We conducted an epidemiological survey on university students, using the standardized questionnaire based on molecular and clinical markers for the diagnosis and management of type 1 VWD. MATERIALS AND METHODS: All blood samples were tested for complete blood count, prothrombin time, partial thromboplastin time (PTT), and platelet function analyzer (PFA-100). MAIN OUTCOME MEASURES: Samples had an abnormal result of PTT and/or PFA-100 were tested for von Willebrand factor (vWF) antigen and factor VIII (FVIII) activity. SAMPLE SIZE: 2000 university students aged between 17 and 22 years were included. RESULTS: Of these students, 730 (36.5%) had reported bleeding symptoms, 326 (44.6%) had agreed to give blood samples, 116 (35.5%) samples had prolonged PTT (>41 s), 48 (14.7%) had prolonged PFA-100 adenosine diphosphate, 39 (11.9%) had prolonged PFA-100 epinephrine, and 72 (22.0%) had abnormal results in both PTT and PFA-100. Out of 275 samples tested for vWF (Ag and activity) and FVIII, 13 (3.9%) had reduced levels or nonfunction of vWF and 5 (1.6%) had reduced FVIII levels. After correlation with ABO blood group, only 5 (1.6%) cases were confirmed for vWD. The prevalence of vWD among Saudi adolescents in the selected student population was 1.5%. CONCLUSION: In this study, we report for the first time epidemiological survey of bleeding disorders in Arab ethnicity. LIMITATIONS: As this is a prevalence study, we have no limitations to discuss. A total of 730 (36.5%) of the 2000 students interviewed have been confirmed as Arab ethnicity and identified as potential candidates for bleeding disorders with at least two positive answer “YES” to any bleeding symptoms questions. The potential candidates identified in the Phase I were contacted for collecting sample; only 326 (44.6%) had agreed to have blood testing to investigate for the bleeding tendency and the other 404 (55.4%) students did not participate: 217 (54%) of them refused sampling, and 187 did not respond (46%) [Graph 1]. Of 2000 students interviewed, 730 (36.5%) suspected to have bleeding disorders because they answered two or more questions in our servey with “yes,”, of which 550 (75%) female and 180 (25%) male. Only 326 from suspected subjects agreed to continue in the study. This studied group consisted of 120 (37%) males and 206 (63%) females with a median age of 19 years whereas minimum age was 17 years and maximum age was 22 years. 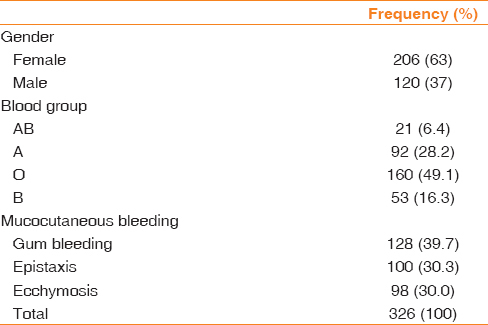 The most common symptom of the responders was mucocutaneous bleeding, whereas 128 (39.7%) had minor gum bleeding when brushing or flossing, 100 (30.3%) had epistaxis, and 98 (30.0%) had ecchymosis [Table 1]. Of 326 blood samples tested for CBC, PT, PTT, and PFA-100, 275 samples had abnormal results whereas 116 (35.5%) samples had prolonged PTT (>41 s), 48 (14.7%) had abnormal PFA-100 ADP, 39 (11.9%) had abnormal PFA-100 EPI, and 72 (22.0%) had prolonged results in both PTT and PFA-100 by both cartridge EPI and ADP. Out of 275 samples that have abnormal results (PTT, PT, and PFA-100) tested for vWF (Ag and activity) and FVIII, 13 (3.9%) had reduced levels or nonfunction of vWF and 5 (1.6%) had reduced level of FVIII. After correlation with ABO blood group, only 5 (1.6%) cases were confirmed for vWD. The medians (normal ranges) of vWF antigen, vWF activity, and FVIII activity were 101.5 (25–178 (U dL)-1), 102.5 927–178 (U dL)-1) and 183 (31%–335%), respectively [Table 2]. Von Willebrand EA. Hereditary pseudohamofili. Finska Lakaresallsk. Handl 1926;67:87-112. Favaloro EJ. Von willebrand disease: Local diagnosis and management of a globally distributed bleeding disorder. Semin Thromb Hemost 2011;37:440-55. Zimmermann TS, Ruggeni ZM. Von Willebrand's disease. In: Spaet TH, editor. Progress in Hemostasis and Thrombosis. Vol. 6. Orlando, FL: Grune & Stratton; 1982. p. 203. Sadler JE. A revised classification of von Willebrand disease. For the subcommittee on von Willebrand factor of the scientific and standardization committee of the international society on thrombosis and haemostasis. Thromb Haemost 1994;71:520-5. Castaman G, Tosetto A, Rodeghiero F, Makris M, O'Shaughnessy D, Lillicrap D, editors. Von Willebrand Disease Practical Hemostasis and Thrombosis. Oxford, UK: Blackwell; 2009. p. 73-87. Lillicrap D. von Willebrand disease: Advances in pathogenetic understanding, diagnosis, and therapy. Am Soc Hematol Blood 2013;122:3735-40. Mohanty D, Shetty S. Von Willebrand disease: An update. J Blood Dis Transfuz 2014;5:238. Owaidah T, Al-Momen AK, Alzahrani HA, Albanyan A, Alsulaiman A, Khawar S, et al. First report from the Saudi bleeding screening study: Are platelet disorders more common in Arabs? Blood 2015;126:4641. Bowman M, Mundell G, Grabell J, Hopman WM, Rapson D, Lillicrap D, et al. Generation and validation of the condensed MCMDM-1VWD bleeding questionnaire for von Willebrand disease. J Thromb Haemost 2008;6:2062-6. Siddiqui KS, Abu-Riash M, Al-Suliman A. Translation and adaptation of English language questionnaire into Arabic for implimnation of a large survey on assessing the symptoms of bleeding disorder in Saudi Arabia. J Appl Hamatol 2017;8:156-8. Chen YC, Yang L, Cheng SN, Hu SH, Chao TY. Von Willebrand disease: A clinical and laboratory study of sixty-five patients. Ann Hematol 2011;90:1183-90. Gill JC, Endres-Brooks J, Bauer PJ, Marks WJ Jr., Montgomery RR. The effect of ABO blood group on the diagnosis of von Willebrand disease. Blood 1987;69:1691-5. Rodeghiero F, Castaman G, Dini E. Epidemiological investigation of the prevalence of von Willebrand's disease. Blood 1987;69:454-9. Werner EJ, Broxson EH, Tucker EL, Giroux DS, Shults J, Abshire TC, et al. Prevalence of von Willebrand disease in children: A multiethnic study. J Pediatr 1993;123:893-8. Gursel T, Bumin C, Ozaltin S. von Willebrand disease The prevalence. Nature Turk J Med Sci 1992; 16: 324-30. Kundak T, Demir M. von Willebrand in the central villages of Edirne Province disease frequency detection. Trakya Ü.T.F. Internal Diseases A.D. Thesis; 2004. p. 1-55. Sap F, Kavaklı T, Kavaklı K, Dizdarer C. The prevalence of von Willebrand disease and significance of in vitro bleeding time (PFA-100) in von Willebrand disease screening in the Izmir region. Turk J Haematol 2013;30:40-7. Yilmaz D, Karapinar B, Yeniay BS, Balkan C, Bilenoglu B, Kavakli K. İzmir'de von Willebrand Hastalığı sıklığını belirlemeye yönelik epidemiyolojik çalışma. Ege Pediatri Bülteni 2005;12:151-9. Zaher G, Adam S, Outcomes of congenital bleeding disorders. Bahrain Med Bull 2012;34:P78. Al-Fawaz IM, Gader AM, Bahakim HM, Al-Mohareb F, Al-Momen AK, Harakati MS. Hereditary bleeding disorders in Riyadh, Saudi Arabia. Ann Saudi Med 1996;16:257-61. Kumar S, Kishore R, Gupta V, Jain M, Shukla J. Prevalence and spectrum of von Willebrand disease in Eastern Uttar Pradesh. Indian J Pathol Microbiol 2010;53:486-9. Karimi M, Haghpanah S, Amirhakimi A, Afrasiabi A, Dehbozorgian J, Nasirabady S. Spectrum of inherited bleeding disorders in Southern Iran, before and after the establishment of comprehensive coagulation laboratory. Blood Coagul Fibrinolysis 2009;20:642-5.